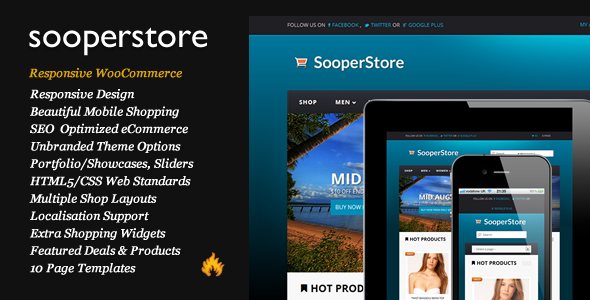 Sooperstore is a clean, ultra responsive WordPress eCommerce theme built specifically for WooCommerce. 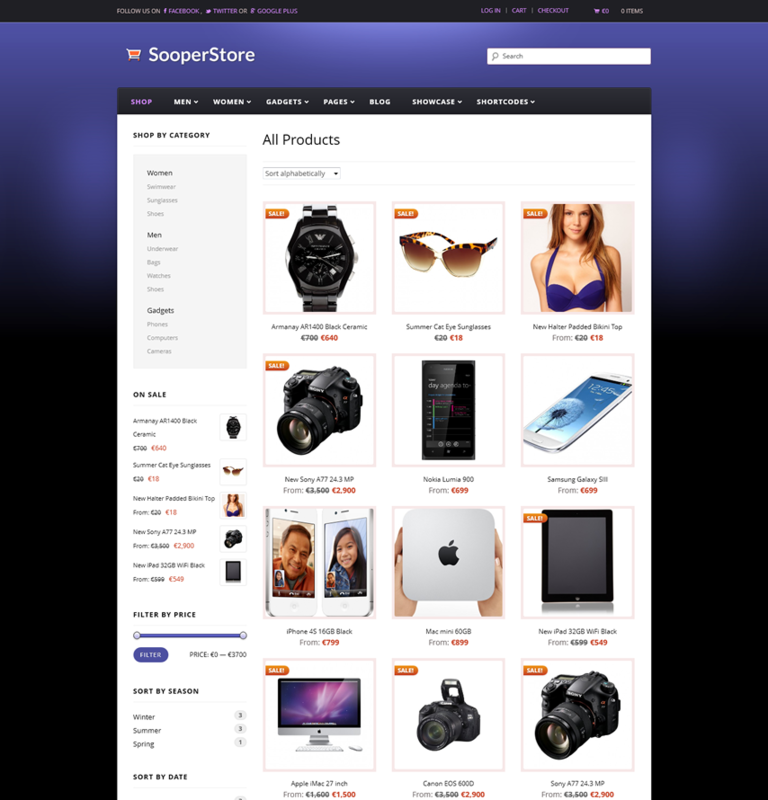 We’ve spent countless hours refining Sooperstore on both the iPad and iPhone to deliver a beautiful shopping experience. Key features like sliders, carousels and accordions have all been tested on tablets and phones aswell as the desktop to ensure no users are left behind. 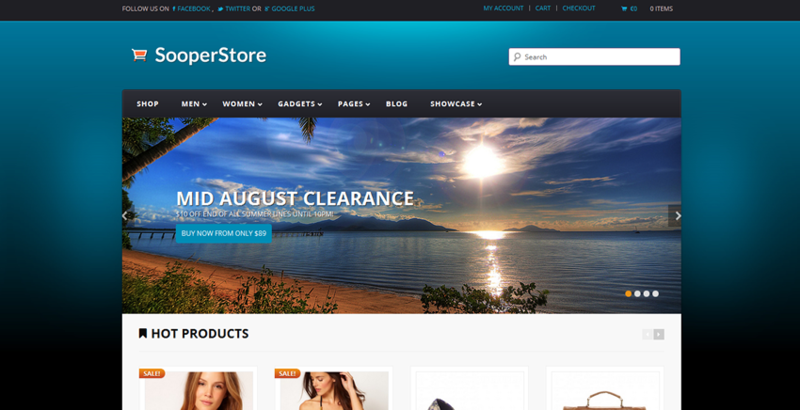 Your entire product catalogue will be displayed beautifully across all modern platforms. We’ve even created a few custom responsive WooCommerce widgets to make sure the experience is just right. Sooperstore has very detailed documentation to help you get setup in a matter of minutes with easy to use drag and drop widgets rather than countless theme options. SEO is incredibly important for any online store. We’ve extensively tested Sooperstore with the leading SEO plugins – in particular WordPress SEO by Yoast. State of the art responsive shopping experience – all aspects of WooCommerce have been given the responsive treatment. State of the art HTML5/CSS3 web standards including the HTML5 Boilerplate. jQuery Nivo Slider integration for Homepage Slider & Showcase – proudly promote your best selling products. Social Media Ready – display and link to your Facebook, Twitter and RSS feed from your homepage. Fully widgetized Homepage layout – control your homepage with WordPress drag and drop widgets – with 11 widget areas you can completely customize your homepage layout without any coding skills. Featured Deals Widget – easy to use widget that let’s you feature key deals to your customers from your homepage. 5 Unique color schemes – only a couple of lines of CSS to create other color schemes! Compliant in all major modern browsers. Includes detailed step by step setup guide + documentation! Optional sub (and sub sub) menus can be displayed on left/right column of pages. I provide free support 7 days a week for Sooperstore. I always aim to respond within 24 hours – and usually a lot quicker! I realise how important it is to have access to the theme author to answer any questions you may have. Sooperstore ratings are speaking for themselves. 5 Star support is part of the package! - Fix for incorrectly displayed "No products found which match your selection" message.